When you were at school, you were introduced to such a varied range of concepts, topics, studies, and theories; there was geography, biology, poetry, maths, history…the list goes on. But how much do you remember? Very little I bet. What about that business book you read last year, do you recall that? Likely your answer is no. Don’t worry; it’s completely normal. There’s even a name for it. Introducing ‘The Forgetting Curve’. The Forgetting Curve is a well-known (and quite disliked) concept in the training industry. If it weren't for this, your employees would download the new skills we teach like a piece of software, able to call on it whenever they need. But as we’re not machines we are victim to The Forgetting Curve. In 1885, Hermann Ebbinghaus, a German psychologist, hypothesised the nature of forgetting in a self-conducted experiment, which led to him creating the Forgetting Curve. A replication of his experiment in 2015 confirmed the results again. 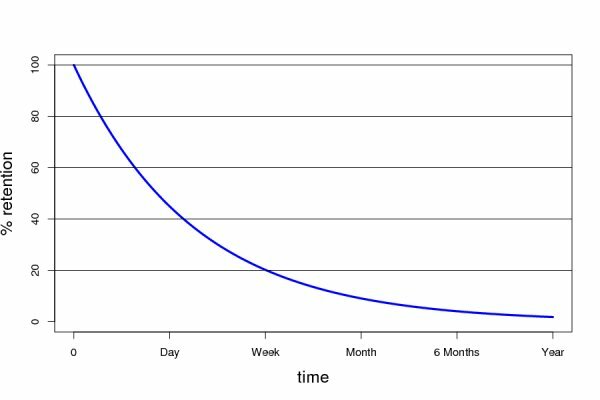 A typical graph of the Forgetting Curve shows that we tend to halve our memory of newly learned knowledge in a matter of days (in fact within 20 minutes you are likely to only retain 58%), unless we consciously try to counteract the curve. When you are investing your businesses money and employees time in training, the Forgetting Curve needs to be recognised and addressed, to maximise value. This is quite self-explanatory. By repeating something, it is more likely to stick. Therefore one easy suggestion is to ensure your employees are reviewing the notes and classwork regularly. Ideally, this will begin the very next day after training. Study groups, projects, and planned follow-up sessions will help to facilitate this repetition. Quality of memory representation is the best way to retain information over the long-term. To improve the quality, the training has to be relevant and meaningful to the learner. You need to be able to connect the learning to something of significance in your work and/or life or connect it to something you already know well. Carrying out a skills assessment and getting to know your employees career aspirations will help to ensure their training is right. We all forget, it is part of being human, but you can try to go against the curve by investing in quality training and development.